Bilateral and multilateral donors occupy a critical position in the prevailing human rights business model. Their funding is essential for advancing human rights, yet with their current approaches, they may also be inadvertently accelerating the process of closing civic space. In 2015 alone, serious threats to civic freedoms were documented in over 100 countries. While donors partner with civil society to counter shrinking civic space, their frequently rigid funding systems—which often focus on short-term projects rather than long-term struggles—can actually undermine effectiveness, and hamper support to new movements critical for social change. Institutional donors now need to critically reassess their role in the human rights business model. Part of this process—which needs to be participatory—should involve a move towards a more empowering system that prioritises long-term and sustainable support to established NGOs and emerging social movements. Today’s donor models to support human rights causes derive largely from donors’ desire to easily evaluate their contributions and to immediately identify and quantify successes. They are also a product of the “copy and pasting” of the development or service-provision paradigm to human rights and democracy work. This has been formalised through “log-frame” based designs and “indicator-ism” whereby project success is defined by achieving an indicator, an oft-critiqued model that assumes degrees of causality between donor-funded activity-driven projects and desired social outcomes. The eagerness to achieve short-term and quantifiable results has pushed human rights groups to devote energy to—and claim successes from—project activities. For instance, an NGO will stretch its claim to effectiveness by attributing the arrest of a government official to an online petition it ran against corruption, but it has no capacity to follow up to ensure a corresponding conviction. Or an NGO will proclaim that speaking at the UN Human Rights Council for two minutes—with hardly any listeners—is an “indicator” of its impact internationally. Holding a number of workshops is taken to be an indicator of “increased awareness.” And there are many more examples. 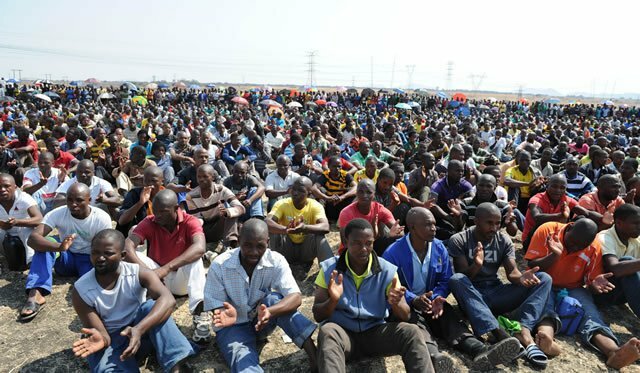 Miners protest in South Africa. Social movements that have the genuine capacity to address structural inequalities in society—such as labour movements—are often overlooked, ignored and underfunded. Yet this paradigm propels associations towards short-term activities rather than towards seizing opportunities in the long-term struggle for social justice. It also creates competition between associations as each strives to position itself as the most successful, instead of joining forces to achieve lasting change. This is unfortunate, since the major human rights achievements of the past century were— without exception—the result of alliances between various actors, working from diverse angles and with different tools but all strongly united in the “struggle”. Donors have favoured the supply side over the demand side of democracy and human rights. In addition, donors have favoured the supply side over the demand side of democracy and human rights. Government institutions and structures have received a lot of “good governance” support, without equivalent investment in the demand side of governance. Even more, civil society is oftentimes told to work with government institutions if they want to access donor funds. Yet this fundamentally denies the independent and crucial role civil society has to play in democracy, and chokeholds associations to the brink of survival. Finally, the current funding approach blanks out support for social movements, directly by donors or indirectly by existing organisations, as they are not enabled to seize opportunities as they arise, or to catalyse social movements, which have—throughout history and across cultures—advanced human rights and social justice. Whether through associations formed in the workplace, or through people assembling on the streets, such movements often emerge unexpectedly and without infrastructure, frequently now propelled by social media. Often emerging in times of profound crisis, they reflect the organic demands of ordinary people for recognition, equality, social justice, redress and change. Social movements are often messy, unpredictable and have long-term visions for social change that are difficult to assess and evaluate. Yet, despite their transformative power, social movements are currently overlooked in donor priorities. The opportunity cost of this business model is far from benign. Social movements that have the genuine capacity to address structural inequalities in society—from labour unions to pro-democracy protest movements—are overlooked, ignored and underfunded. Their galvanising potential can be lost, often before it is able to properly form. Take, for example, the recent wave of peaceful protests in the Oromia region of Ethiopia. Where should local organisers turn to for support, capacity and solidarity? Do the legitimate demands of the people met by state repression and many hundreds of deaths, not deserve more and better support than post-facto funded analyses, reporting, and advocacy? As I reported to the United Nations General Assembly, there is a global trend towards the weakening of workers’ rights that requires human rights organizations—including donors—to urgently include labor rights within a broader human rights agenda. The current dominant approach by donors reflects the unintended negative effects of donor benevolence, and also a paucity of ambition and an abdication of responsibility. Donors should realign their priorities towards supporting long-term struggles for social justice. Progress in achieving human rights cannot be captured in quarterly reports; sometimes it takes generations. Sincere partnerships involve a multi-annual commitment to the cause and priority should be given to nurturing ideas, promoting joint strategies, and advancing grassroots organizing abilities. This must not only involve a different engagement with existing organisations, but also a proactive approach to identifying and supporting new and emerging social movements, and engaging with actors traditionally side-lined within the human rights field (for example, labor movements). Second, donors sincere about supporting civil society should not shy away from frank interactions with national authorities. All too often, narratives claiming that foreign funded human rights work undermines sovereignty or national identity are used by national authorities, even as they beg for this same foreign funding and support. Further, donors seem to retreat more and more to capitals and headquarters, following social change on their screens, when they should be reinvesting in local engagement, accepting that not all investment yields success. Third, donors must commit to a results framework whereby seizure of opportunities is favoured over ticking off activities and producing deliverables. This will indeed involve relinquishing a degree of control about the form of the supported human rights work, while insisting on transparency and accountability. Social change, by its very nature, is driven by the people and their associations. Donor support for human rights and civil society is badly needed in all corners of the globe to parry today’s extremely precarious situation. But a willingness to change and be creative, to invent new ways of supporting rights, is pivotal for democracy and development. Donors, just like us all, need to think tactically to get us out of this position.